Some of the comments from our Facebook page. Duncan Lees - Later proved to be trampled in intrusive modern material. Lynne Keys - Oh dear, not that hoary old one! Philip Treveil - We put a sausage in an environmental sample bucket on Poultry. Area 11, I think. Must check the Roman volumes to see if it ever turned up in the text (not that I was ever given a copy! ). 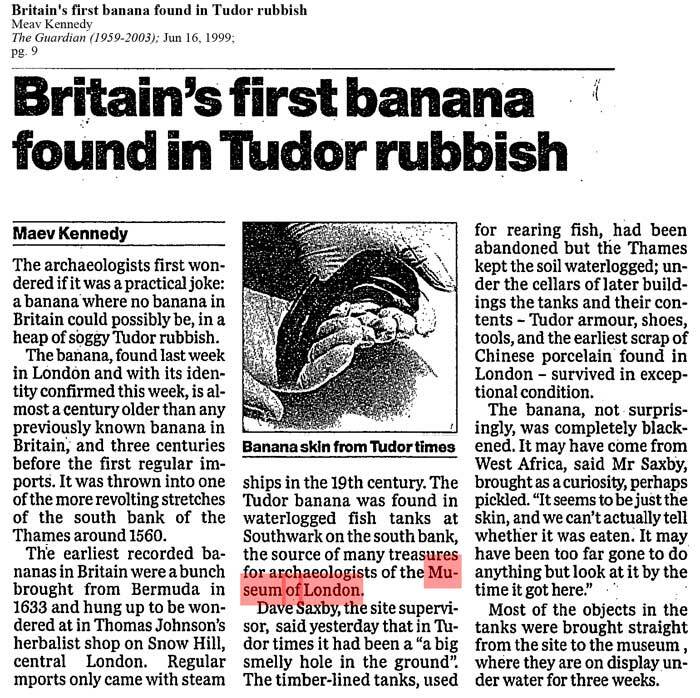 Peter Eldon Rowsome - Yes I think 'Mr Saxby's blackened banana' turned out to be fake news! Jackie Keily - Ah it's my favourite story. Still use it in teaching! Jennie Brigham [Trev B]- Reminds me when a member of the public salted a trench at Mansell St as a joke with a rather nice greenglazed 'medieval' gargoyle head he'd made and called in next day to crow about how he'd put one over on the diggers. Unfortunately we didn't know what he was on about as we'd failed to spot it. After a short search he found it on the spoilheap with a nice mattock hole through it. He called attention to our parentage and seemed to think we were unprofessional, which was probably true, as only the week before, Dom P had referred to us in the Baynards as the 'B Team', and he was never wrong, though Gina seemed to want to kill him at the time and had to be restrained.